Blue Alien Repair was officially opened shortly after Steve decided that working for a major music retail store was not going to be a satisfying way of life. While working in a store that large it was apparent to Steve that “Customer Service” was not the goal of its owners! The goal of a major retail chain is and will always be about “Separating the customer from their money”. This was a major conflict with what Steve believes in. If you have ever had any work done in his shop you will know in an instant that Steve loves “Saving a guitars life”! 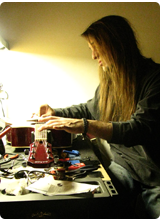 Steve is always up for a challenge when it comes to things like, wiring, broken headstocks or even just adjusting a guitar to its owners playing style. One thing Steve takes pride in is Honesty. You can always count on fast turn around times and fair prices. 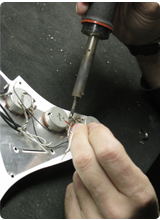 At Blue Alien Repair you will never be pressured into having work done you or your instrument don’t need or want. The way of doing business in a major store is so different in so many ways. While working in a major store a General Manager will make repair decisions before talking to the technician. He will also diagnose a problem and immediately give a price to the customer. You talk to a qualified doctor who then gives you a thorough examination before telling you what is wrong. That’s just how it’s unfair and unprofessional to the customer. 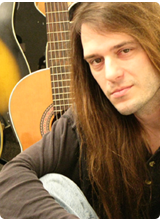 Steve has been playing music since he was 8 and has been playing guitar since he was 12. He started taking them apart and putting them back together almost as soon as he started playing. Obsessed with always trying to improve the way they play and sound, he was lucky enough to know the owner of a local music store who let him set up his employees guitars and basses (and some of the store instruments too). Even though Steve was only 12 years old, the stores customers soon found out it was Steve who was setting up the stores guitars and started requesting set ups to be done only by Steve and not the stores employees. At the age of 16 Steve became a technician for a company that handled contracted jobs for AT&T and the United States Military. Some of the work Steve was responsible for went into our F16 fighter jets! Customer goes into major store and talks to the General Manager (or anyone other than the technician) and gets a quick diagnoses and repair cost. Now the work is put in front of the technician and he is told what the customer has been told. Lets say the customer was told it was a $10.00 repair and it will take ten minutes to fix. The technician opens the guitar and finds that the repair job is going to be an all day wiring project and its cost is going to be $120. Now right from the start the technician looks bad because there is no way the work will be done in ten minutes so he has to deal with an angry customer. The second bad part about that is the job will have to be done for $10.00. If your boss came to you and said we want you to work three times as many hours and we are cutting your pay down two thirds. What would you do? 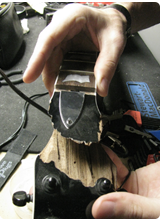 This true story serves as the foundation of the “mission statement” for Blue Alien Guitar Repair. Fast Service – Steve only takes in what he can get done in the next 24-48 hours. The only time you’ll see other guitars lying around the shop is when they need parts, extensive gluing, or when it’s a big repair job. 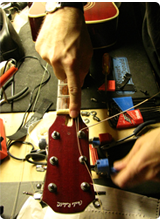 Quality Repairs – He has over 25 years of experience fixing and modifying guitars. He won’t let you leave until he’s sure you’re satisfied with the work he’s done. You will play your instrument and have it fine-tuned for you on the spot. Reasonable Prices – Steve is always willing to work with his customers to keep repairs costs low. He also doesn’t have a music store taking a cut. You’ll never have to talk to a commissioned salesman or a know it all manager. You pay for parts and his time and expertise. That’s it. 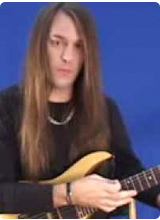 At the age of 12 Steve got his first guitar. By the age of 13 he was playing in local clubs. 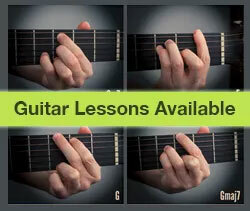 At the age of 17 Steve shot his first instructional video and continues to teach and do videos to this day.